These rustic antique cans were once used for storage of gasoline, kerosene, oil, water, and more. 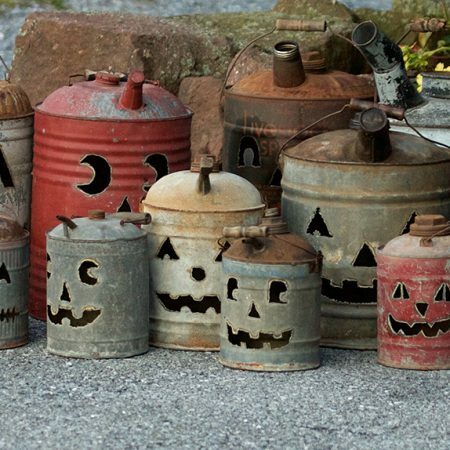 Now, instead of rusting away in an old shed, these vintage choices will enjoy a charming new life on your doorstep every Halloween. Each unique face was hand-drawn and plasma-cut by Tish and Mike Bachleda. No two are alike and the choices vary constantly. If you are interested in purchasing, please contact us and we’ll share photos of the designs we have in stock at the moment. For potential lighting needs, we cut a round access hole into the bottom of each gas can. If a watering can or other unlidded design, we do create an opening to allow rainwater to escape. These are shippable. Check out our Gas Can Snowman designs, too. Perfect for primitive Christmas decorating. $35.00 - 75.00 Add to Wish List What is this?